To cap off the exciting year that was 2018, TikTok, the world’s leading short video platform, today reveals the celebrities, creators, challenges and soundtracks and more that made this year another one to remember. Globally, everyone comes together over the weekends, to make their own short videos on the platform. Indians also get busy with TikTok on weekends and what’s more interesting is that they were most active from 11:00 PM to 1:00 AM. Celebrities from all over the world made TikTok their playground this year, with its easy-to-use features allowing them to give fans a sneak peek into their moments. A diverse list of stars who have gained a massive following on the platform come from all over the world, including American music producer Marshmellow, K-pop chart-toppers WINNER and BLACKPINK, Puerto Rican rapper Daddy Yankee as well as American social media personality Baby Ariel, who tops the list with almost 30 million followers on TikTok. Across India, some of Bollywood’s most popular actors made their debuts on TikTok including Shahid Kapoor, Jacqueline Fernandez and Tiger Shroff. Many of the biggest trending videos of 2018 come from TikTok challenges, which allow fans from all over the world to participate in local conversations in their communities. Among the most popular challenges include the #raindropchallenge which made waves all over the world, especially across the Philippines, Malaysia and Vietnam. In India, the challenges that filled everyone’s feed include #DameTuCosita, which was all about dancing with the green, animated alien as well as #DidiDance challenge, which involved doing a specific set of dance moves while dancing to the Didi song. As a platform to engage a growing fan base and a global audience, TikTok also served as the launchpad of a diverse array of local creators. Social media maven Holly H, content producer Gil Croes, choreographer Awez Darbar along with K-Pop dancer Sona are among the creators who made waves globally. Meanwhile, some of the creators to watch in India include Nagma Mirajkar, Unnati Malharkar and Paras Tomar. Got a song you can’t seem to get out of your head? Chances are, you heard it from a TikTok video, as the app has increasingly become a launchpad for diverse videos set to catchy music. 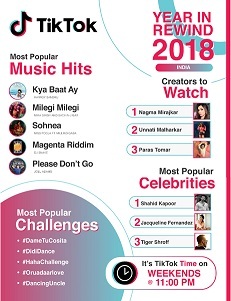 Among the most trending soundtracks of 2018 used on TikTok videos include “Run Free” by Deep Chills feat. IVIE, which was popular not only globally but also in India, Malaysia and Taiwan. Global hits like Havana (feat. Young Thug) by Camila Cabello, Please Don’t Go by Joel Adams and In My Feelings by Drake were a rage on TikTok as well. In India, the most trending tunes on TikTok are Kya Baat Ay by Harrdy Sandhu, Milegi Milegi from the movie Stree and the Punjabi hit Sohnea by Miss Pooja Feat. Millind Gaba. Not only to capture moments that matter in their lives, but celebrating diversity and creativity through content. 2018 also saw TikTok in India reach a historical milestone of over 5.3 million videos uploaded by users on the festival of Diwali! Want to see how your own year went? Revisit your own journey with TikTok this year as the short video platform unveils “My Year in Rewind”, an in-app experience offering a personalized lookback, launching in India on December 19, 2018. Download the TikTok app via iOS or Google Play to get started.